This collection, carefully chosen and arranged by Walter Hooper, is the most extensive ever published. 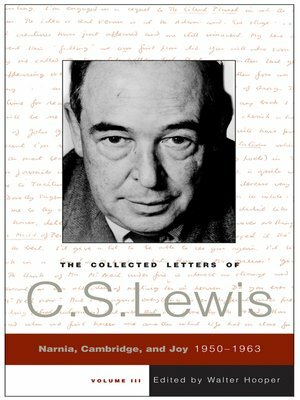 Included here are the letters Lewis wrote to such luminaries as J.R.R. Tolkien, Owen Barfield, Arthur C. Clarke, Sheldon Vanauken, and Dom Bede Griffiths. To some particular friends, such as Dorothy L. Sayers, Lewis wrote fifty letters alone. The letters deal with all of Lewis's interests—theology, literary criticism, poetry, fantasy, children's stories—as well as his relationships with family members and friends. The third and final volume begins with Lewis, already a household name from his BBC radio broadcasts and popular spiritual books, on the cusp of publishing his most famous and enduring book, The Lion, the Witch and the Wardrobe, which would ensure his immortality in the literary world. It covers his relationship with and marriage to Joy Davidman Gresham, subject of the film Shadowlands, and includes letters right up to his death on November 22, 1963, the day John F. Kennedy was assassinated. This volume also includes both a special section of newly found letters from earlier time periods covered in volumes one and two and mini-biographies of Lewis's regular correspondents.